We select 10 or 15 buckets of produce out of each load and feed it to the piglets. To make it easier for them to eat we slice the cantaloupe and pineapples open with a flat-bladed shovel. The other things are small enough that they can eat them without too much trouble. There's a lot of concern about corn-fed animals; I'm not all that concerned about it. Fresh sweet corn is a treat for the piglets,and it's fun watching them eat it. Here's what surprised me. In the picture above there's bananas and melons and mangos and romaine lettuce, and these piglets are fighting over the romaine. They'll eat the entire head of lettuce before they eat the rest. That's one of the nice things about feeding a varied diet -- the animals can pick and choose what they need out of the feed. I think that they crave a salad, just as we do. Once the romaine is gone, the melons are next. The pineapple isn't as popular as the cantaloupes, but it'll go in good time. Even with lots of room and lots of food, there's still some squealing and pushing. They are little pigs, after all. about 20' away, here's the scene with the big pigs. Nom Nom Nom! the 40 pigs will eat 10 yards of produce in 2 hours. This little pig has decided that cantaloupe is his favorite. And having found a portable piece, he's running very quickly away from the rest of the herd to enjoy it in private. Pigs are very concerned about having other pigs take their meals. Every spring I wonder if I have too many piglets, and then I get a call asking for 15 or 20 at a time, and I then immediately switch to wondering if I have too few piglets. It doesn't look like it, but there's 80 pigs in this pen. This is a trough that we use when feeding vegetables or fruit to the little guys. It's a recycled culvert; scavenged from a road construction project, cut in half, and with a frame built around it. It's easy to clean, sturdy, and best of all, cheap. At this time of year, since we still have frosts and cold, we use bowls for their water. In the warmer seasons I much prefer automatic waterers, but if the supply hose freezes the pigs are out of water. So we go old school, with bowls. for 80 pigs we use two two-door feeders. These feeders have seen many years of use, and while they are more than I'd like to pay, they do save time and feed. each one holds about 200lbs of feed, which means feeding the little pigs is a once-every-10-days chore. Anything I can do to reduce labor is good. The domes are calf-domes, with 6" of wood chips and a couple of flakes of hay on top of it. The pigs like to burrow into the wood chips and cover themselves with a blanket of hay and seem happiest that way, so we make sure to provide all of the ingredients for a warm pig bed. We're nearing the end of our lambing season; it's pretty amazing when the size of your herd increases dramatically in a week. The lambs are all legs and wobbling for the first day. After a week they start to do the lamb bounce -- jump up in the air as high as you can, straight up! This little guy and his sibling (the black and white to the right) are a couple of hours old. The greenhouse provides very nice, light, warm area. In fact, it's 42 degrees outside, with a stiff breeze, and inside the greenhouse it's 70 degrees. So warm I took off my coat. They start being interested in the hay we feed the sheep very early. This guy cannot be more than 3 days old and he's munching away. The ewes tell them apart by voice and by smell. We pick the time that the sheep lamb by penning the rams away from the ewes until the appropriate time. We do that to concentrate the chore of lambing into as small a time as possible, and to time the birth so that when the lambs are big enough to go out there's good grass for them to go out on. During the last 4 weeks of pregnancy, we supplement the hay and minerals we feed to the ewes with about a pound of feed per day. We do that because these sheep produce twins or triplets, and that takes a lot of calories -- we've tried it strictly grass fed and lost ewes. During lambing we check on the sheep 3 times a day, looking for any problems or complications. this year we did lose a ewe; autopsy showed that she had pneumonia, and that the stress of pregnancy plus that put her down; even watching the sheep every day we didn't notice that this one was sick, which is a pity. She was a nice ewe. Once the ewe lambs we move her into a small pen, about 4' across, called a sheep jug, with her lambs. she stays there for a day or two. We do that so that we can watch the ewe and lambs, and make sure that things are good. Sometimes ewes will reject a lamb, sometimes a lamb will have issues; putting the mother into a jug means we can catch this and take appropriate action to make things right. After that day or two, we put the lambs into group housing with the other sheep that have lambed. We try to sort the lambs by size -- bigger lambs will steal milk from other mothers, and we want to have as little of that as possible. Once lambing is done, we'll take note of the production of each ewe, and make the decision on which to keep and which to send to auction. And when the grass is well started, the flock goes out onto the fields. One word that is used quite a bit in farming is "sustainable", and it's used in farming so much that it's almost become just a noise. Many people claim that their farming practices, or timber harvest, or fishing method, is "sustainable". In fact, "sustainable" is a goal that many producers strive for; it sounds good, and it seems to mean something to consumers. When you look up the definition of Sustainable agriculture there's actually a pretty clear definition, and what it has that I think bears reflection is the words "...that will last over the long term"
When someone says that they have a "sustainable" farm I think that the first thing that should come to mind is how long they've been doing it. I've too many "sustainable" farms come and go. When I think about what I'm doing, or what I will do, I do so with the idea of doing the same sort of thing 3 years,5 years, or 10 years from now. I'm 48 years old; I will probably live into my 70s; that means that everything I want to do will have to be in the next 22 years. That's the limit of "sustainable" for me, and during the last decade or so - or sooner - I'll have a decreasing physical ability, so my term is shorter than I'd like. For me, a sustainable farm is one where it makes a profit and looks like an attractive job for someone else -- because I like the idea of setting something in motion, and having it continue after I'm gone. That's the sort of sustainability that appeals to me. Doing something for 6 months and then finding out that you have to do something else isn't sustainable -- by definition. When I look at farms that completely change their whole operation every year or two I don't consider them "sustainable" -- because they didn't sustain. They didn't endure. And I wish they'd stop using the word. We've got a pair of bald eagles that are raising their young in the woods behind my farm. I know this because we see them pretty much every day. They are terrorizing the ducks and turkeys; our guinea fowl are the air-raid warnings; when they see the eagles coming they sound the alarm. The picture above is of one of the eagles taking off after making a try at my ducks. The picture above is of what I think is the immature eagle; I think it's last years hatch. Look at the feathers at the end of the wings (click on the photo for a larger version) and compare it to the feathers on the ends of the parent. It's too big to be a redtailed, but I didn't get a very good look at it. I really have to watch my small critters with the eagles around. They don't really bother anything bigger than a dog, but they're really lethal with ducks, chickens and lambs. Late February to early March is the start of the piglet season. "Do you sell small pigs?" yes, we do. We've got about 80 to choose from. Do you have a breed preference? "well, I'd like a pink one". We've got pink pigs. When would you be looking to pick it up? "Pretty soon. Maybe Saturday. Can I ask you a question?" "What do you feed a pig to keep it small?" umm... what do you mean by 'keep it small'? "Well, my friend has a little dog that she can fit in a purse, and I'd like to keep the pig small like that so that I can use a dog purse for it. " ah. I'm not sure how to say this. Do you eat meat? Ok, our pigs are farm pigs. They are full-sized pigs. Most of the people who buy them grow them out to be their pork for the fall. "Well, I know, but I've seen your pictures, and they are sooo cute!" Yes, they are cute. But there's a problem when they get bigger. Well, when they're mostly grown, they'll weigh about 300 lbs, and they hog the couch. Yes. And they're very hard to carry. "oh. so they don't stay small?" No, but they are delicious! "Hi Bruce, this is Jane. I bought 3 pigs from you last week." ah, hi. Jane? sorry. What's up? "I've got a few questions. When I put the pigs into the pen it seems like they were fighting with one another, and one of them scratched the other one. What should I do about it? " do about the scratch? or piglets fighting? "no, they settled down after that, but I've been wondering about it"
Can you tell me about the scratch? "It's just a red line"
So it didn't break the skin and there was no blood or anything? Jane, is there any reason that you think that 5:30 am on saturday is a good time to reach me? Well, I was up and I... Oh, I'm sorry. Did I wake you up? "Hi, yes, am I wonders you homeacres farms?" Yes, this is homeacres farms. What can I do for you? How big a pig do you want? "I want big pig. 200 kilos"
Ok, I think we have four of those. When were you looking to pick it up? Today... it's 3:30 and it'll be dark at 5:30. If you have a trailer we can load it for you if you get here in the next 30 minutes, but otherwise we can't do it. "My cousin said you have pig!" Yes, we have the pigs, but we don't load animals after we close, and we close at dark. "But I must have pig! " How long have known that you'll need this pig? "It is wedding! very important! " I understand it is important and I'd like to help you. How long has this wedding been planned? Why didn't you call me last week? it takes me 9 months to come up with a fat hog -- I may not have any to sell you. "We had other farmer, but he sold pig he told us he had." Did you put down a deposit on a pig? "No, we see pig and say we want"
But no deposit -- did he say it was your pig? "No, but he had pig. " I'm sorry that you have this problem. If you'd like, I can get you the pig first thing tomorrow morning, but I can't do it in the time we have left tonight. "But I must have pig!" I'm sorry that you have this problem. If you give me more time I can help you. I've built a lot of fences from scratch on my farm. What I'm going to talk about in this post is stuff that I've learned. A properly placed and sized gate can make your life much easier. 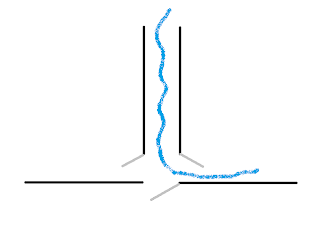 The picture above shows a typical setup; two rectangular fields with an alley or driveway between them. I've drawn in what I consider to be the minimum number of gates to to access that field. As a general rule of thumb you can't have too many gates. At the top, pointed to by green lines, are the tractor or main access gates. My experience has been that these need to be at least twice the size of the biggest thing you'll move through them. If your tractor is 6' wide, your gate should be at least 12. It would be better if it was 16. Spend the extra 15% to buy the bigger gate. You will never notice gate width until it's too small. You will never have a gate that is too big. Believe me. I've had to replace gate posts many times. On my farm I've standardized on 16' gates for all main access points. 8' for all man gates. 8' seemed excessive at one point for me. It doesn't seem that way any longer. Cows are big. Also in that picture above I've shown a couple of man gates; I'll put a man gate into all areas where I would have to walk more than 200' to get around the fence. I even put man gates into the perimeter fence -- because I keep animals, and they get out sometimes, and it's nice to be able to open a gate to get them back in. The other thing that a man gate does in an exterior fence is to give you an easily observed access point. If you've got someone who wants to get into your property, and there's a gate nearby, chances are excellent that they'll use the gate in perference to climbing your fence. A $50 game camera placed so that it photographs activity at the gate will give you a good idea of who or what is on your property -- and for my urban semi-urban farm, I've found that very useful. If you don't offer a man gate, they'll cross your fence in a random place. Lay out a welcome mat so that you can greet them appropriately. 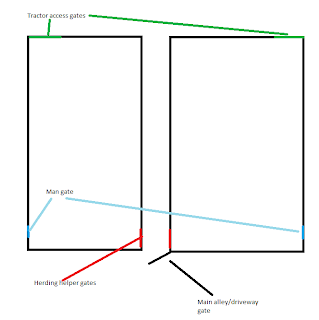 The picture above is a detail drawing of the herding helper gates. Imagine that the grey line in the center is your main farm gate, and on either side you have fenced pastures. By having a gate that is at the end of the driveway, you've got an easy way to direct livestock in the event they get out. That blue line might be a cow that you're chasing around. Wouldn't it be nice to just close your main gate, open the herding helper gate, and then shoo the cow in? 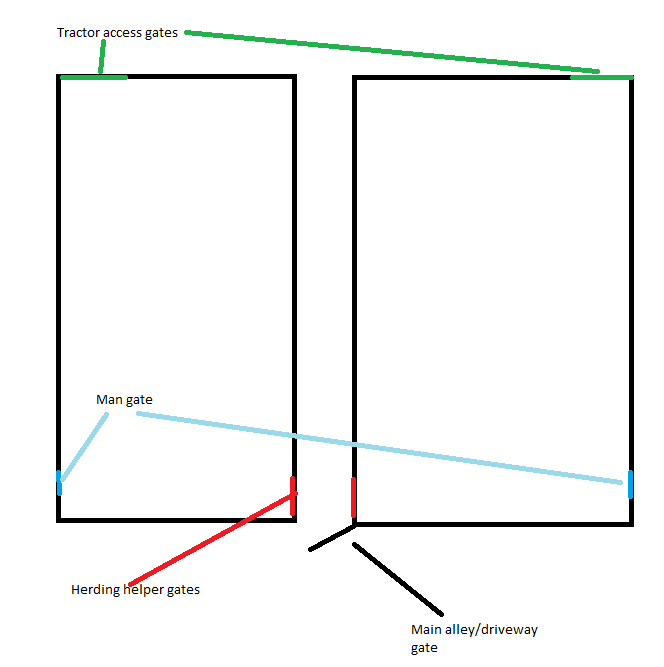 And if you make the herding helper gates half the width of your driveway, by opening them you could move animals across your driveway with no chance of strays. Wouldn't that be nice? The picture above is how I started building gates. 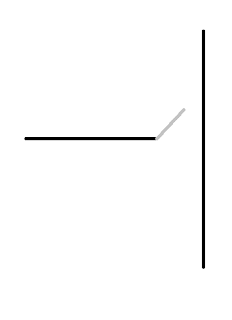 Notice that the grey line hits the fence on the right. I consider that a mistake now. Here's why. If you're opening the gate, you're on that swinging end. It's pretty hard for you to stand inside the gate and open it. You end up grabbing the gate and pulling it back towards you. If you add a short length of fence on the swinging end of the fence, you get a much more workable gate. 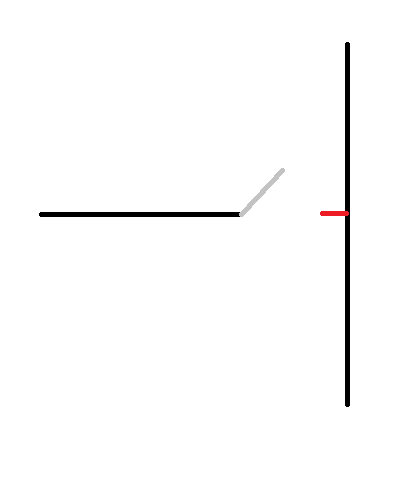 That little red line means that you can stand and open the gate without having to move. It seems pretty silly, but when I have not built that little red line of fencing, I've really regretted it. So much so that I've redone gates to fix it - dug up the posts and reset them. Take a look at the first picture in this blog. See if you can spot the mistake in the main farm gate as drawn. The city of Seattle is taking 7 acres of land and making an edible landscape out of it. Planting food producing trees and plants in a permaculture setting; persistent plants. I like the idea of it. Just a fact, but do you know what the largest number of tilled acres is? And if your first guess is farms, that's wrong. It's the median areas of highways and other roads. Wouldn't it be cool if the center of the freeway was corn. or melons. Or pumpkins. Or anything other than some ornamental grass or shrub? This works for other types of businesses, why not farming? Set up a farm, allow people to get their feet wet by growing some plants. Provide a farm stand where people can sell their stuff directly. Take some of the hard parts out of farming for the new farmers. Like that idea? Then read this article about a farmer incubator that's running north of Seattle. Would you wait 5 years for a 10 square foot garden? With thousands of acres of land FALLOW 10 miles away, 1,654 people are on a waiting list for 10'x10' garden plots - and there's just 54 of them available. We have thousands of acres of river bottom that is perfect farmland that isn't in use. Why? Feeding the pigs the produce on concrete has had interesting results. Heres a picture of the produce load before the pigs started eating it. There's quite a bit of leafy green stuff there; lettuce and cabbage, and a variety of other fruits and vegetables. 24 hours later, the pigs have eaten everything that they like out of this load, leaving a very different looking material. They don't like oranges or onions or brussel sprouts (the green things in the picture above), peppers or potatoes. This particular load we mixed with a half yard of potting soil (with the plants) and what we ended up with looks like potting soil. Interesting. The cleanout takes about 5 minutes. Tractor goes in, scoops up the material, backs out. We carry this material over to a compost pile, where the stuff the pigs don't like will be converted into good soil. I'm kinda liking this concrete feeding thing. Take a look at the leftover material, above. Click on the picture for a bigger version. It looks like topsoil already. The concrete itself gets pretty clean; there's a very light layer of mud, and a little bit of material on either side. 2 minutes with a flatbladed shovel to bring that stuff to the center, another scoop, and we're ready for the next feeding cycle. My initial impression is that more of the food is going into the hogs; less is trampled into the mud. Cleanup is certainly much easier - I designed it so that the feeding area was 18" wider than the tractor bucket to make that possible. Now I think I'll try loads that don't have potting soil in them. I'm hoping that what the hogs don't eat (oranges, potatoes, onions, etc) we can scoop up and present to the cows, to get even more use of the fruit. First, I'd like to say that I own two kubota tractors, and I don't own a single John Deere. And I use those kubota tractors every day for a variety of things; in fact, my two farmhands use them every day. Every day... I'm say that we put 200 hours of running time a month on each tractor. We love our tractors. This is the way a wheel looks when it's not broken. This is the front wheel. In the center right of the picture, notice a square headed bolt. A bunch of those is what holds the outer part of the tractor wheel to the inner hub, which is attached to the axle. This is what it looks like when the mount for that bolt breaks off. In fact, most of the mounts broke off on one tire, and the tire fell off the tractor. This is a 1996 Kubota 9850, so this particular part might be original equipment; but even so, I wouldn't expect a WHEEL to come apart like this. Think about your car -- how often does the steel part of the wheel on your car break? So I'm not happy about this to begin with. So I call the Kubota dealer that I work with, and the parts guy takes the tire size, and I ask him for a price and a leadtime -- I can either replace this part, or weld it back together. I'm leaning towards welding anyway, but I want to know what it would cost. I'm figuring $300 or $400, something like that. Kubota no longer makes this part. You can't buy a new one. The American ethos for tractors is that you keep them forever, basically. Once they've had a useful life on your farm, they'll tend to go to anther farm, and another one. A john deere 8N tractor made in the 50s is a pretty common sight in the country. That's a tractor that is 60 years old. You can buy spare parts for it. Heck, if you break the frame, you can still buy the cast iron parts. But Kubota seems to have the opinion that they'll support their tractors with spare parts for...what? 10 years? 15? And if it breaks after that, you're out of luck. Yes, I can probably find a wheel somewhere off some dead tractor, or weld this one back together, but this is the SECOND time that I've had some part of this tractor break and been told that they no longer sell it. Summary? If I were in the market for a used tractor, I think I'd buy green. Because I can get the parts I need to keep it running. And I'm saying that as a satisfied customer of Kubota. When they're not broken they are really nice tractors and do a good job. But when they do break it's an emergency to get the PARTS to fix it any more. It's already an emergency to have the tractor broken -- I don't need this sort of help. 1) When you stop making a particular part, search through the parts for other tractors and see if another part will fit. In this case, there may be another kubota tractor that uses this size wheel and lug pattern -- but there's no easy way for the dealer to find it. 2) If they can't find it, and it's no longer made, I can't give the dealer any more money. The dealer would like to have my money. I'd like to support the dealer. Neither of us like not having a part for a working tractor. 3) Reconsider the lifespan of your tractors, particularly in the American Market. All things equal, I could be using this tractor on my farm for another 10 years. And the guy who buys it from me for another 10. 10 to 15 years is WAAAY shorter than the average farm tractor lifespan in the US. 4) Look at what your competitor is doing, and consider that I'm a tractor buyer and user. I'm going to have a serious bias AGAINST kubotas next time I purchase. They've revised the maximum river level down, and the high tide has passed without incident. I'm going to stand down for now. Whew! River is high already, flood warning has been issued. We've gotten probably 4" of rain, with another 7" forecast. River level will peak tomorrow around 5pm. Anything above 27' is something to watch; check the trailers, make sure that the corral is in good shape. above 29' and you start to worry about the dike around the island. at 32.5 feet the dike gets overtopped. Low tide is tommorow about noon; at 5pm it's high tide. River peaks at 5pm. We're having the functional tests of the barn, but it occurred to me that this was a little like a barn construction set. With the slab underneath, you can move the blocks around to reconfigure the barn in a few minutes. The picture above is the feeding area; it's 9' wide and 30' long, which is enough space for an entire trailer load of produce at a time. The produce comes in looking pretty good; in this particular load we got some potted plants, which the pigs sometimes will eat, other times they'll ignore the plant, but mix the potting soil into the load as they eat the fruit and vegetables. Makes for better compost. If there's no potted plants we will add a scoop of wood chips to help soak up the excess liquid. Here's the first customer. There's a saying you don't want to eat in an empty restaurant -- I think pigs would prefer that. Here's the feeding in full swing. Notice the goat standing on top of the pile. He likes romaine lettuce. Generally speaking, this appears to be enough space for the pigs to get in and eat the produce. It's sized so that a single tractor scoop will clean the area. I think I need an apron on the outside, though. It's tough to get the trailer right up to the opening. with a concrete apron we'd dump there, and then push it into the feeding area. This is the first time that I've been able to see clearly how much volume the pigs eat. When they got done with this batch it was down in volume by at least 75%. I'll let them root through it tonight and see what it looks like in the morning. We've been working on this barn, and getting close to finishing the walls, and you're probably wondering about the duck; I'll get there. One of the sows got out of the paddock, and didn't get noticed for a while; she made her way over to the poultry greenhouse, and decided to go inside. Greenhouse plastic isn't much of a barrier for a motivated sow, and she apparently spent the day in there, rooting around, eating the chicken feed, looking for eggs..
and unfortunately, stepping on some poor ducks foot, breaking it. Sometimes the menu is a volunteer, sometimes its an accident. Felt bad for the duck, but didn't want to waste it. 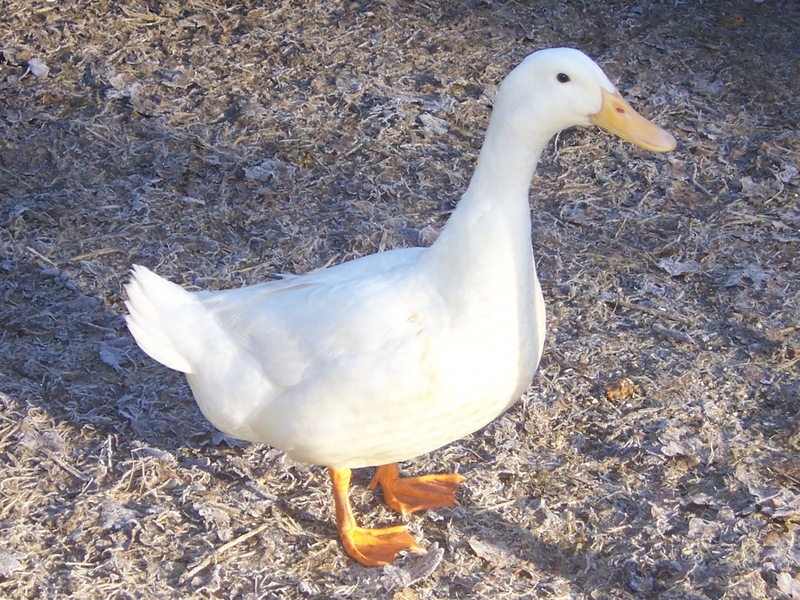 Nice white duck, maybe 4lbs dressed. Humanely dispatched, and laboriously plucked. So I ended up with this duck. Now I'm off to see what I can do with a fresh duck. Progress on the barn in the last couple of days. The concrete slab has cured enough that we can run equipment on it and assemble the new barn. My main tractor is out of commission, so I rented a backhoe to place the blocks. The backhoe weighs more than my biggest tractor, and carrying a 4,000lb block makes a nice stress test. Slab took the weight and load easily. Sean's driving the backhoe, Dan is positioning the blocks. He's using a rake so that he's at a safe distance from the block in case of chain or hydraulic failure. 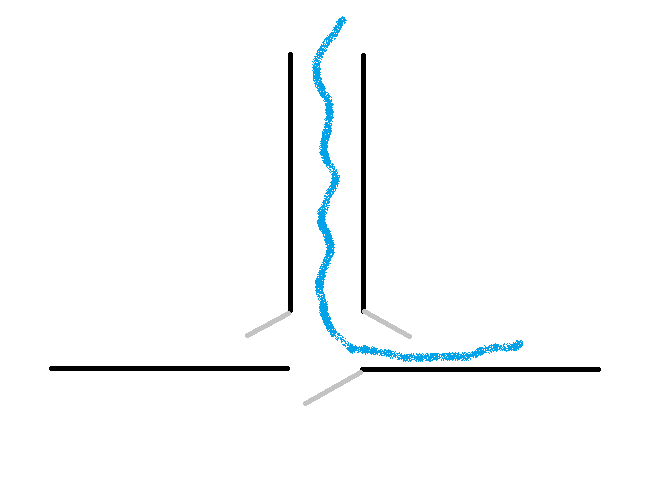 What he does is spin the block until it's lined up in the appropriate direction, and then the block is slowly lowered into place. The blocks interlock, and sitting flat on a concrete slab, they're pretty sturdy. I'm using them so that I can clean out the barn with the tractor without having to worry about the walls getting messed up, and being in the flood plain, building a structure that won't float away or be damaged in the event of a flood. I'm pretty sure that these ecology blocks don't float. We're going 3 high on the side walls so that we can use deep bedding; I'd like at least 18" of chips underneath the pigs, and I want the side walls to be tall enough that even with that bedding the pigs can't get to the roof structure. So 6' side walls of concrete blocks will do both. We'll be feeding the pigs on one end of this barn; and in doing so today I noticed that the stuff that the pigs don't like to eat (onions, oranges, potatoes, peppers) get separated nicely. That's very interesting -- the cows and sheep will eat all of those things. I've been thinking about ways to sort the oranges and so on out of the produce, but the pigs seem to be doing that pretty well by themselves. Which got me to thinking. If this continues, all I have to do is scoop up stuff the pigs don't eat and present it to the cattle. Looks like I'll be using the food even more efficiently. I like that. The pigs are checking out their new accommodations. A few scoops of wood chips and they're making themselves nests and squabbling about who sleeps next to who. I'll have the walls completed tomorrow. What will we do with all this food? I ran across a blog recently that said something that I've been thinking, and it really made a lot of sense to me - "community-scale food thinking"
There are many people who "farm" by raising just enough to feed their social group; friends and family, with the occasional outsider thrown in. There is nothing at all wrong in that, and in fact, I'd like to see more people get involved with their food. But what I'm interested in, what I'm doing, is community-scale farming. My goal is not to just feed my friends and family, but to produce enough that I can provide that same food I eat to others; maybe hundreds of others, or thousands of others. It's my little way of removing that sale from the usual channel, and I think that's a good thing. By providing an alternative to the anonymous meat case I'm also providing the animal with a different experience than they would normally have - and I'm providing the customer with as much information as they wish about how it was raised, what it was fed, how it came to be, and how it ended. In my blog here I've written about every step the food takes to reach your plate at one point or another. Community-scale farming requires you to start making decisions that aren't solely based on your personal desires -- it becomes more market-driven. More responsive to the community. You grow what the customer wants, not whats' cool. You deal with the retail end of this business -- and customers can be tough at times. For me that's meant a crash-course in cultural differences in eating and religions, and in dealing with each groups handling of something that is very personal to you. Make no mistake-food is personal. It's your culture and your heritage and its all rolled up in your family. I've really appreciated the insight I've gotten into the different groups by providing them with the basics to make their traditional real to themselves and their children. So that's what I do. I'm not a multinational conglomerate. I'm not a faceless package. I'm a community-scale farm, and I serve the needs of the local community, particularly those that want to know more about their food. The blog entry that inspired this.